My brother’s 40th birthday quilt is finished. Label is sewn on the back, it is washed and ready to send over with my husband who is heading to the USA in two weeks. Did I mention his trip is during the two weeks of school holidays? How did he swing that one? I have two quilts with binding sewn on and my goal is to finish those over the holidays. One quilt was cut out three years ago, so well overdue to finish it. My last Material Obsession class for the term is tomorrow and I will be plotting my next big project. There are just so many gorgeous quilts in the first and now second Material Obsession books it is going to be hard to choose. Feeling a major sense of accomplishment on this quilt. Would be walking on air if it wasn’t for head cold bringing me down to earth. More photos of the quilt are on flickr. 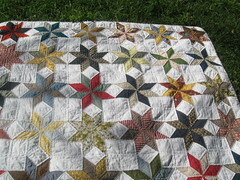 As I type the last star was just quilted and the binding is going to get cut as soon as I post this entry. We borrowed a cute kids embroidery book from the library that was too advanced for my kids. 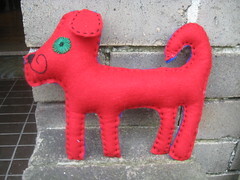 One of the projects in the book was this very cute felt dog. It was a very easy project and the kids had a fun time picking out the colors and embroidery floss colors for the eyes. It kind of reminds me of Clifford the Big Red Dog. Now the challenge is who gets to claim ownership of the dog. Two kids, one dog……will have to see who has the stronger will. Life just continues to fly by. I can’t believe we are almost to the end of June. I feel like I haven’t accomplished a lot on the crafting front this year, but then I look at the quilt I am finishing and the balance of life with two kids and building a house and think I have to be a bit more realistic with what I can accomplish right now. Enough procrastination with the post, off to cut the binding! I have been obsessively hand quilting night after night and finally am down to the last eight stars. It roughly takes me one a night, so hopefully in a week I will be up to the binding. It looks really good, but the time commitment of the hand sewing was definitely more than I anticipated. I am glad I am coming to the end because I am itching to finish, start and sew other things!!! My husband took the kids to Nanna’s house for the three day weekend and left me to my own devices. I broke out the sewing machine and whipped up a bean bag chair for Rhys. I used this pattern found at this link. It was so nice to sew lots of straight seams and have a break from the hoop and quilt wrestling I have been doing most nights while hand quilting. I wasn’t sure how big this bag would sew up because there was no reference to scale. Rhys is five and a half and it is a perfect size for him. The instructions were fantastic and easy to follow. My only issue that came up was I didn’t have enough fabric. Initially I was going to use just the green fabric, but then found out I didn’t have enough. It was a good excuse to use up some of the novelty prints I had lurking. I am enclosing a photo with Rhys to give you an idea of just how big it is. I will be sewing up a pink one as soon as the quilt is done! I also overstuffed mine insert and had to take some out to make the bag a bit more squishy. Wish me luck on the quilting and I have a few little projects I hope to post with later. I succumbed to much purchasing at the quilt craft fair and have much sewing ahead.